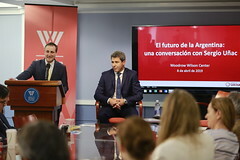 Argentina’s election of a pro-market president three years ago did not settle its national debate over free trade and the impact of globalization, and sharp partisan divisions remain in the run-up to the country’s October presidential election, according to a new poll by the Woodrow Wilson International Center for Scholars and Poliarquía. What did the overthrow of the Chilean President Salvador Allende have to do with Indian nuclear weapons? At first glance, perhaps not a lot. However, archival documents from the Nehru Memorial and Museum Library in New Delhi reveal that there was indeed a connection made between the two in 1974. During his 2015 presidential campaign, Mauricio Macri promised “pobreza cero.” Though he was vague on his proposed strategy and timeline, the goal helped soften his image as an out-of-touch millionaire. Q: In 2013, the Argentine Soccer Association (AFA) introduced a law prohibiting the entry of visiting fans to local stadiums during soccer matches. Nevertheless, there have been repeated violent incidents, such as in Floresta, when the All Boys soccer hooligans attacked police; and in Nuñez, when River fans hurled bricks at Boca’s team bus as it tried to enter the stadium. Why have police outside stadiums been unable to reduce this violence? José Luis Espert, a well-known economist, author and long-time political commentator, launched his presidential campaign in December as the candidate for the newly launched Libertarian Party. Though President Mauricio Macri’s gradual fiscal austerity and market liberalization program has produced mixed results, Mr. Espert promises a supercharged free-market reform program. *THIS SEMINAR WILL BE IN SPANISH, WITHOUT SIMULTANEOUS TRANSLATION AVAILABLE. Despite challenges facing Argentina’s national economy, Mendoza, Argentina’s fourth-largest province and the beating heart of its celebrated wine industry, remains a source of investor optimism. The province has benefited from a high level of integration with global markets and a diversified local economy, which includes major players in agriculture, mining, energy, tourism, and winemaking.